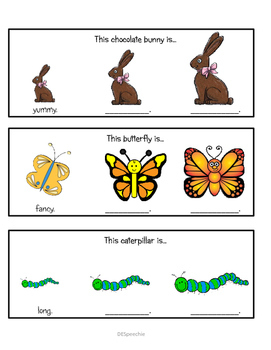 Here are comparative / superlative picture cards and worksheets with a spring theme. 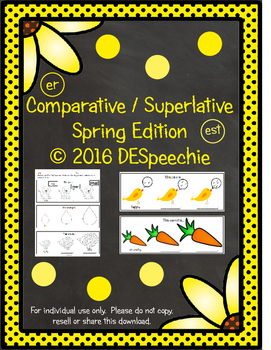 My Comparative / Superlative Spring Edition includes 15 picture cards (in color) and 5 worksheets (black and white) using the same adjectives/adverbs as the picture cards. The adjectives/adverbs included are: fruity, gooey, pretty, yummy, fancy, long, loud, big, fluffy, wet, high, tall, happy, crunchy and bright. 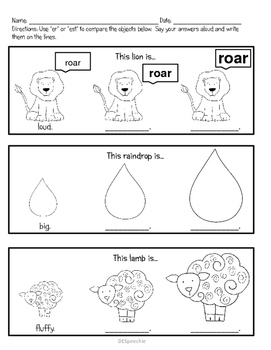 The picture cards are great for speech therapy language groups but can also be used to address carryover of articulation, voice and fluency skills. 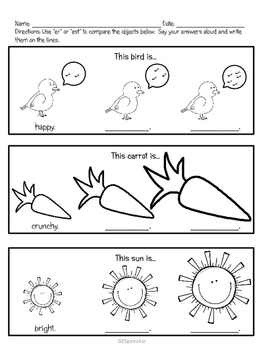 The worksheets can be used in therapy or as homework to help facilitate carryover. I hope you enjoy this product. I look forward to your feedback.